In our family, baseball has always been less of a pastime, more a way of life. Something that most people who live outside of Southern California don’t realize is that when your kids play ball in this region, there is no baseball “season.” Rather, at the high school level you have summer ball, followed by fall ball, then winter ball, and finally spring season. Prior to that, from the time your child is 4 until he or she graduates from middle school, you are afforded the opportunity to jam-pack every day of the week with Little League games, practices and related volunteer activities. And don’t forget travel ball, which is available — for a price — to any age, any time. 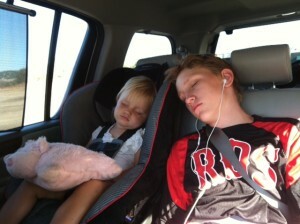 Our sons, Tanner and Braden, played all. Concurrently. For as long as I can remember, our baseball schedule has been all-encompassing, usually requiring my husband and I to each grab a boy and go our separate weeknight or weekend ways. We decided to make an off-season trade: goodbye Volvo, hello gargantuan, gas-guzzling SUV. I retired my Little League coaching position, and when Aubrey arrived in November 2010, we couldn’t wait to add our little rookie to the family lineup. Considering that she was born in the midst of a statewide whooping cough outbreak, we didn’t dare risk exposing Aubrey to church, a restaurant or grocery store before she was 4 months and properly safeguarded by two rounds of vaccinations. 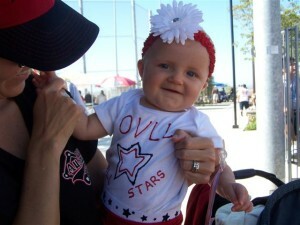 But she was just a mere 3 weeks old when she attended her first (open air) travel ball game. Like any good utility player, Aubrey proved to be exceptionally adaptable. 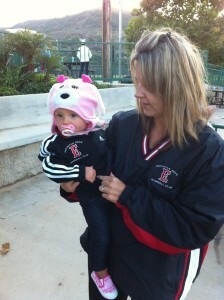 She nursed while I slouched in my foldout chair, never missing a single pitch that Braden threw. If Tanner’s evening games proved too chilly, we simply relocated to the colossal back seat of our mammoth SUV and watched our leftie line doubles from the parking lot. When All Stars rolled around, I bought fabric paint to decorate her onesies with Braden’s team colors and jersey number, although Aubrey barely got to show off my handiwork, napping contentedly in her stroller through almost every game. Likewise, she coordinated effortlessly with the rest of the family at Braden’s weekend-long travel ball tournaments, sporting her mini Encinitas Reds zip-up in the stands. 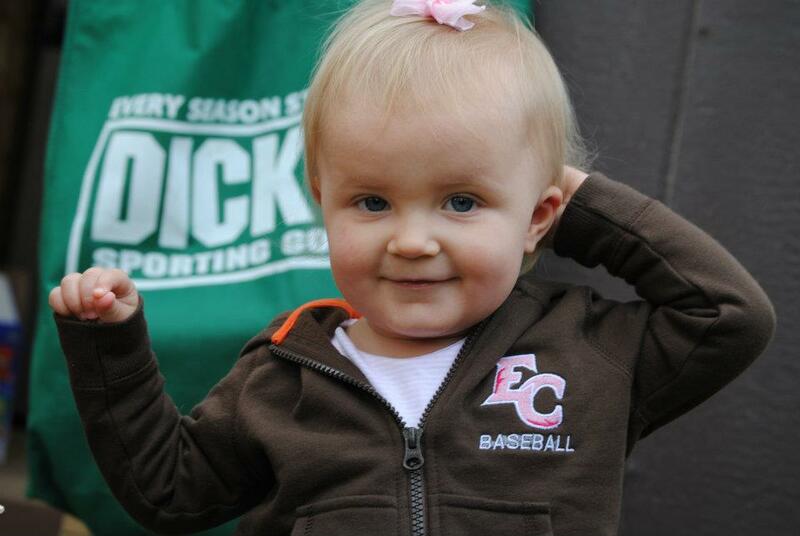 And when I scored an 18-month-sized dark brown sweatjacket on a clearance rack at Target, Aubrey had the privilege of donning what I believe to be the only El Camino High School baseball logo ever embroidered in pink, just to support her oldest brother’s team. 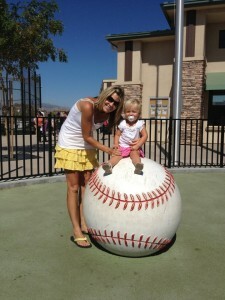 Baseball has certainly afforded our girl a number of travel opportunities. 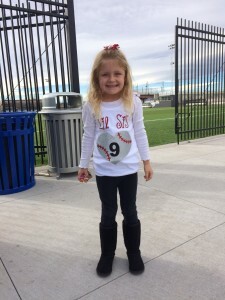 In addition to traversing virtually every mile of San Diego County over the years, at 6 months she road tripped to Las Vegas for Braden’s Reds tournament. She’s been to Arizona on multiple occasions to cheer on both of her brothers, and journeyed to the greater Los Angeles area more times than I can count. 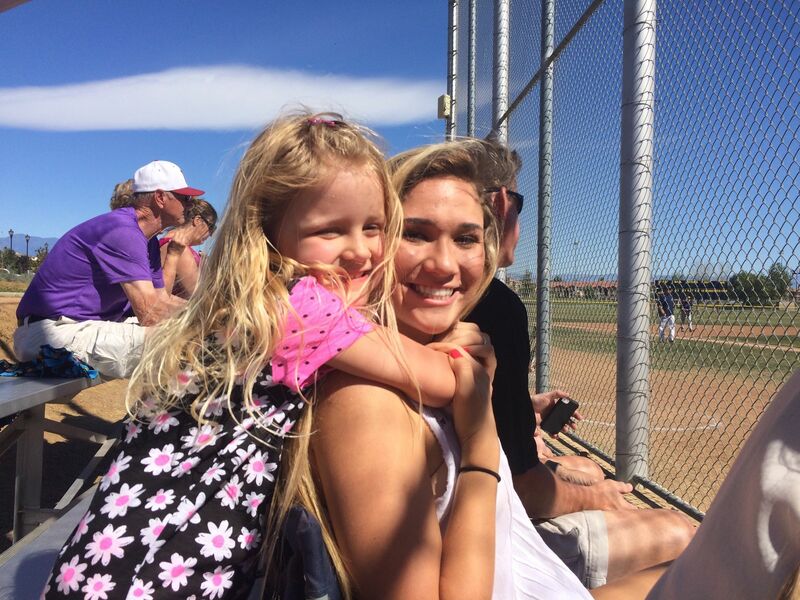 This year, she even jetted to Denver for Tanner’s opening weekend of college baseball. 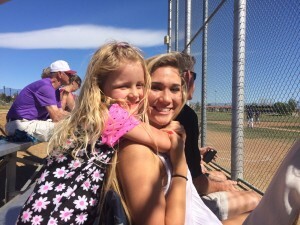 Aubrey has cheerfully endured games in which temperatures soared above 105 degrees, and bundled up for a couple where change ups were tossed amid snow flurries. She is equally well-seasoned at juggling a busy schedule. 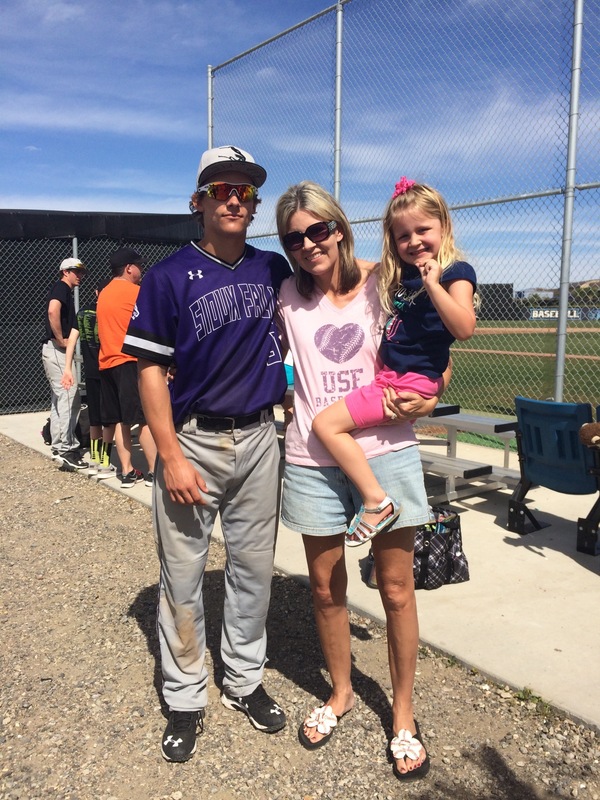 This past March, when Tanner’s college team ventured from South Dakota to SoCal, we took in 10 games in a seven-day stretch between her two brothers, with nary a complaint. In fact, I wish I had a nickel for every time someone turned to me and said, “She is such a trooper.” It sounds trite, but yeah, I guess she kind of is. Granted, it requires an entire team just to transport the lineup of accessories we haul to games in an effort to keep her occupied (once again, thank you gargantuan, gas-guzzling SUV). In addition to a bottomless supply of fruit snacks, juice boxes and Goldfish, there are coloring books, stickers, magnetic paper dolls, bubbles and a variety of balls. I even invested in a special duffel that boasts the perfect dimensions to tote a small dollhouse. Better than toys are teens. (More specifically, girl teens.) With a virtual harem of high school cheerleaders that began cooing at her when Tanner was just a freshman, Aubrey had amassed quite a fan following by the time her brother graduated from high school last year. And the love affair was very mutual. Surpassing even the allure of attentive teenagers, though, is the rare opportunity when one of her brothers’ teammates has a sibling anywhere close to Aubrey’s age (when your kids are spaced 12 to 15 years apart, this unfortunately doesn’t occur often). And in the absence of peer playmates, I must give kudos to all of my fellow Baseball Moms who, in the spirit of “it takes a village,” have collectively doled out Skittles and Sour Patch Kids, generously brought Aubrey special toys, and even took turns playing with dolls and horses, keeping her occupied through marathon innings. As one season folds into the next, it’s not surprising that our girl sometimes has trouble remembering which player families go with which of her brothers’ multiple teams. 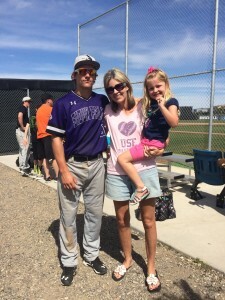 Invariably, a couple of times each month as we are packing up to go to a game, she will ask hopefully, “Will Summer be there?” But Summer’s brother, like Tanner, is now playing college ball. Four years after being thrust into this life of nonstop baseball, we are beginning to see signs that our little fan’s patience might be waning. In a voice that is compellingly close to a whine, she will sometimes plead, “Can we go now?” … before we’ve even closed out the first inning. We have more than two years remaining in Braden’s high school and travel ball careers, and with any luck, there will be college games beyond that. And while Tanner’s university is in another state, we try to catch his games whenever possible. In other words, Aubrey still has a lot of baseball left in her immediate future. But she is becoming her own little person — and we aren’t quite sure if it’s one who will be as passionate about the greatest game on Earth as the rest of her family is. Another day, another ballgame, my dear. Understandably, everyone asks when Aubrey will make the transition from spectator to participant. Considering her upbringing, it’s only natural to wonder if one day she will follow in the cleats of her older brothers and make a name for herself on the field, possibly even sporting #9 and staking out third base like both of her siblings. Or, will the only diamonds she is even remotely interested in be the plastic versions she wears in her tiara while pretending to be one of the Disney princesses? Has being drafted into our baseball family left Aubrey destined to share that desire … or jaded her from wanting any future part of it? I guess only time will tell. For now, with her immediate loves clearly defined — dancing and riding ponies — I am forced to consider what our lives will be like if she grows up and (gulp) doesn’t want to play ball. The answer is simple: like any good parents, we will support her in whatever endeavors she chooses. But I’d be lying if I said I wouldn’t miss the crack of the bat, the thrill of a stolen base, the opportunity to voice my discontent with the umpire’s rulings. And what a waste of talent it would be if I no longer had cause to bust out my well-honed infield dirt removal skills while doing the laundry each week. But regardless of what Aubrey decides to pursue, I know I have plenty of cheering left in me. But the truth is, I’m already batting .1000 as a baseball mom. 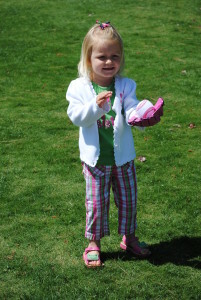 So I have to hold out hope that one day my little diva will find her passion in dirt and diamonds, as well. Above, one of my very favorite shots of Aubrey, as she watched Tanner warm up in the bullpen during his sophomore year in high school … and below, attending one of his college games. Loved your article, so well written. It’s been great watching the boys play ball & especially watching Aubrey’s transition from infant to toddler to the sweet little girl she is today. What an amazing multi-talented family you’ve raised! I’ve loved watching your boys play baseball, and I can’t wait to watch and cheer for Aubrey as she competes in whatever she chooses to do (horses, dancing, softball, anything)! 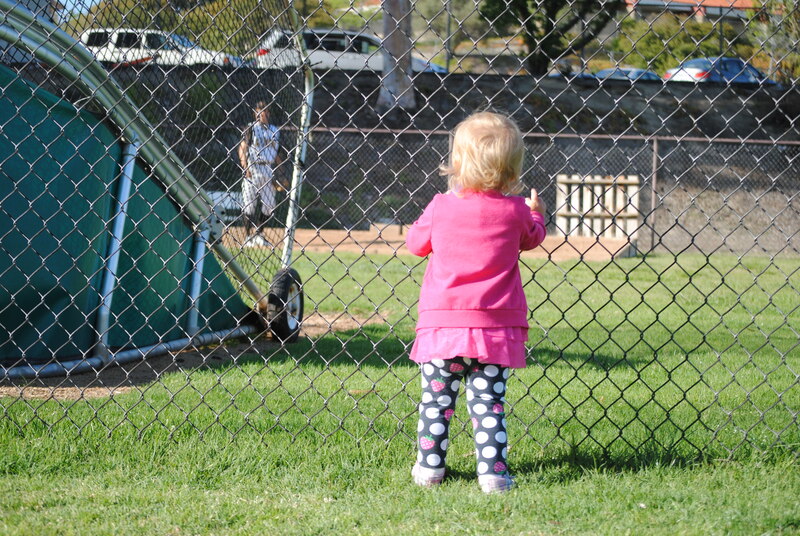 Maybe *someday* we’ll watch our grandkids on the diamond together! I said SOMEDAY! I stumbled across your website just today. I don’t believe any of your stories could hit any closer to home with my family and I! I have two sons (14 and 11) who both play baseball year round. I also have a daughter (age 5) who sounds amazingly enough like your Aubrey! I have laughed out loud and cried like a baby while reading through this morning! Needless to say, I will be following along to read more! Thank you!